They began the season on April 4, 2016 at the Los Angeles Angels and finished the regular season on October 2, 2016 at the Cincinnati Reds. They finished with the best record in Major League Baseball and won their first National League Central title since the 2008 season, winning by 17½ games. The team also reached the 100 win mark for the first time since 1935 and won 103 total games, the most wins for the franchise since 1910. The Cubs defeated the San Francisco Giants in the National League Division Series and returned to the National League Championship Series for the second year in a row, where they defeated the Los Angeles Dodgers in six games. The Cubs defeated the Cleveland Indians in seven games in the 2016 World Series, their first appearance since the 1945 World Series and first win since the 1908 World Series. In the World Series, they came back from a three games to one deficit, winning the final three games, the first team to come back from a three games to one deficit since the Kansas City Royals in 1985. As well, the Cubs are also the first team to win Games 6 and 7 on the road in a World Series since the Pittsburgh Pirates pulled off the feat against the Baltimore Orioles in 1979. The World Series victory put an end to the so-called Curse of the Billy Goat. Minor league free agent RHP Andury Acevedo signed a major league contract with the Cubs on November 19. RHP Ryan Cook was claimed off waivers from the Boston Red Sox on November 19. LHP Jack Leathersich claimed off waivers from New York Mets on November 19. 1B Dan Vogelbach's contract selected from Tennessee Smokies. RHP Pierce Johnson's contract selected from Tennessee Smokies. Catcher Willson Contreras's contract selected from Tennessee Smokies. Switch-hitting 3B Jeimer Candelario's contract selected from Tennessee Smokies. Texas Rangers traded RHP Spencer Patton to Chicago Cubs for 2B Frandy De La Rosa. RHP Ryan Cook's contract was non-tendered by the Cubs, making him a free agent on December 2. LHP Jack Leathersich's contract was non-tendered by the Cubs, making him a free agent on December 2. He was re-signed to a minor league contract on December 23. Cubs sign former St. Louis Cardinals RHP John Lackey. IF Starlin Castro is traded to the New York Yankees in exchange for RHP Adam Warren and a player to be named later. The Yankees completed the deal by trading SS Brendan Ryan to the Cubs on December 17. The Cubs released Ryan on December 23. Cubs sign former Kansas City Royals 2B Ben Zobrist. Cubs sign former St. Louis Cardinals OF Jason Heyward. Cubs trade OF/IF Chris Coghlan to Oakland Athletics for RHP Aaron Brooks. Cubs sign OF Dexter Fowler to one-year contract for $8 million. After just one year broadcasting on WBBM (780-AM), the Cubs announced that the radio broadcast of their games will move to WSCR (670-AM) for the 2016 season. April 7, OF Kyle Schwarber tears anterior cruciate ligament and lateral collateral ligament in his left knee in collision with Dexter Fowler, placed on 60-day DL. Out for the regular season. IF Munenori Kawasaki is recalled from AAA Iowa. April 13, Cubs acquire LHP Giovanni Soto from the Cleveland Indians for cash. April 15, Cubs option IF Munenori Kawasaki to AAA Iowa, IF Javier Baez was recalled from Iowa. April 28, Cubs place C Miguel Montero (stiff back) on the 15-day DL retroactive to April 25. C Tim Federowicz is called up from the minors. May 3, Cubs place OF Matt Szczur (mild right hamstring strain) on 15-day DL. OF Ryan Kalish is called up from the minors. May 11, Cubs call up RHP Carl Edwards, Jr. as the 26th man for the doubleheader. May 14, Cubs activate C Miguel Montero and OF Ryan Kalish is designated for assignment. May 17, Cubs sign RHP Joe Nathan and place him on the 60 day DL. May 21, OF Matt Szczur is activated from the 15-day DL and RP Neil Ramirez is designated for assignment. June 6, OF Jorge Soler leaves game (hamstring strain), placed on 15-day DL. OF Albert Almora, Jr. is called up from the minors. June 9, OF/IF Chris Coghlan is reacquired from the Oakland A's in exchange for IF Arismendy Alcántara. June 9, IF Tommy La Stella (hamstring) placed on 15-day DL. Coghlan to take place on roster. June 9, RHP Joel Peralta signs minor league deal with Cubs. June 12, Cubs claim RHP R.J. Alvarez off of waivers from the Oakland A's. Alvarez sent to AAA Iowa. June 14, Cubs sign LHP Brian Matusz to a minor league deal. June 17, Cubs call up C Willson Contreras from the minors. C Tim Federowicz was designated for assignment. June 20, Cubs place OF Dexter Fowler on the DL. RHP Carl Edwards, Jr. is recalled from AAA Iowa. June 21, Cubs place RHP Clayton Richard on 15-day DL (blister). RHP Adam Warren optioned to AAA Iowa. Cubs call up LHP Gerardo Concepcion and recall RHP Spencer Patton. June 27, Cubs called up RHP Joel Peralta and send LHP Gerardo Concepcion back to AAA Iowa. July 3, IF Chris Coghlan sent to DL with strained ribcage, 3B Jeimer Candelario called up from AAA Iowa. July 6, Cubs activate IF Tommy La Stella from DL and call up RHP Adam Warren from AAA Iowa. RHP Joel Peralta is designated for assignment and C David Ross is placed on seven day concussion DL. July 9, Cubs call up IF Munenori Kawasaki from AAA Iowa, 3B Jeimer Candelario was optioned to Iowa. July 11, IF Munenori Kawasaki sent back to AAA Iowa. July 15, RHP Trevor Cahill to DL (knee), LHP Clayton Richard and C David Ross activated from DL. July 18–20, Trevor Cahill, Dexter Fowler and Jorge Soler are sent to Iowa Cubs for rehab assignments. July 20, Cubs acquire LHP Mike Montgomery from Seattle in exchange for minor league 1B Dan Vogelbach and RHP Paul Blackburn. Cubs also receive minor league RHP Jordan Pries. July 21, Cubs option RHP Spencer Patton to AAA Iowa. July 22, OF Dexter Fowler is activated from DL, OF Albert Almora, Jr. option to AAA Iowa. July 24, Cubs activate RHP Joe Nathan from 60 day DL, RHP Adam Warren optioned to AAA Iowa. July 25, Cubs acquire LHP Aroldis Chapman from New York Yankees in exchange for RHP Warren, minor league SS Gleyber Torres, minor league OF Billy McKinney, and minor league OF Rashad Crawford. July 26, LHP Clayton Richard designated for assignment, LHP Aroldis Chapman added to active roster. July 29, Cubs activate IF Chris Coghlan from DL, option IF Tommy La Stella to AAA Iowa. July 31, Cubs call up LHP Brian Matusz, RHP Justin Grimm optioned to AAA Iowa. August 1, LHP Brian Matusz designated for assignment, RHP Spencer Patton recalled. August 1, Cubs acquire RHP Joe Smith from Los Angeles Angels of Anaheim in exchange for minor league RHP Jesus Castillo. August 2, RHP Joe Smith added to roster, RHP Spencer Patton optioned to AAA Iowa. August 3, RHP Jason Hammel placed on bereavement list, RHP Justin Grimm recalled from AAA Iowa. August 9, RHP Jason Hammel activated from bereavement list, RHP Justin Grimm sent back to AAA Iowa. August 11, RHP Pedro Strop sent to DL with meniscus tear in his left knee, RHP Justin Grimm recalled from Iowa. August 16, RHP Trevor Cahill activated from DL for doubleheader as 26th member of roster, will start game one of doubleheader. August 17, RHP Joe Smith to the DL with a hamstring strain, RHP Trevor Cahill remains on roster. OF Chris Coghlan also placed on DL with rib contusion, RHP Spencer Patton recalled. August 19, RHP John Lackey (shoulder) and RHP Héctor Rondón (triceps) to the DL, RHP Félix Peña and LHP Rob Zastryzny called up from Iowa. August 31, IF Tommy La Stella recalled from Iowa, RHP Spencer Patton optioned to Iowa. September 1 begins the expansion from the 25 man roster to the 40 man roster. OF Chris Coughlan and RHP Joe Smith activated from DL. RHP Jake Buchanan called up from Iowa. September 4, RHP John Lackey activated from DL to make start. September 6, Cubs activate RHP Héctor Rondón from DL. OF Albert Almora, Jr., C Tim Federowicz, IF Munenori Kawasaki, and RHP Spencer Patton recalled from Iowa. RHP R.J. Alvarez designated for assignment. April 7 – Kyle Schwarber and Dexter Fowler collide in the outfield in a game against the Arizona Diamonbacks. Schwarber tears his ACL and LCL in his left knee on the play and is side-lined for the remainder of the season. April 21 – The Cubs hit five homers to beat the Cincinnati Reds 16–0 as Jake Arrieta threw a no-hitter for the second time in 11 regular season starts. Kris Bryant has six runs-batted-in. April 24 – After losing the day before, the Cubs defeat the Cincinnati Reds 9–0 with two homers by Anthony Rizzo. As a result, the Cubs remain the only team in baseball not to have lost back-to-back games. April 30 – The Cubs finish the month of April with an MLB-best record of 17–5. Jake Arrieta is selected National League Player of the Month. May 2 – Cubs announce Jason Heyward has a sore wrist and will miss a few days. May 2 – Matt Szczur experiences tightness in his hamstring and undergoes an MRI. May 3 – For the third regular season month in a row (August, September, April), Jake Arrieta is named Pitcher of the Month for the National League, tying a major league record. May 8 – Cubs have their best 30-game start since 1907, going 24–6 (went 22–4 in 1907). Cubs become the first team since the 1984 Detroit Tigers to win at least 24 of their first 30 games. May 11 – Cubs suffer their first back-to-back losses of the season, the last team to do so. May 18 – Cubs catcher David Ross throws out four baserunners in a nine inning game against the Milwaukee Brewers. May 20 – Right fielder Jason Heyward suffers an injury colliding with the right-center field wall at San Francisco's AT&T Park and leaves game. The team announces he suffered a contusion and will miss a few games. May 24 – Jason Heyward returns to the lineup after missing four games. May 30 – Starting pitcher Jason Hammel leaves a game against the Los Angeles Dodgers after two innings with a leg cramp. Cubs relievers Travis Wood, Justin Grimm, Pedro Strop, and Hector Rondon combine for seven perfect innings to win the game. The Cubs began June with the best run differential, plus 129, and a record of 35–15, also the best. Cubs starting pitchers began the month with a combined earned run average of 2.38. June 1 – Major League Baseball announces results of early All Star Game voting. The Cubs have five players in starting positions: Kris Bryant, Addison Russell, Ben Zobrist, Anthony Rizzo, and Dexter Fowler. June 1 – Jon Lester pitches a complete game four-hitter as the Cubs beat the Dodgers 2–1. June 8 – Major League baseball releases update of All Star Game voting. The Cubs have received the four highest amount of votes among NL teams: Anthony Rizzo, Kris Bryant, Dexter Fowler, and Ben Zobrist. Addison Russell is also leading at SS. June 11 – Jake Arrieta's 8–2 victory in Atlanta gives him a record of 7–0 in road starts and 10–1 overall. June 13 – Jon Lester is named National League Player of the Week. June 18 – Dexter Fowler leaves game after first inning with hamstring discomfort. June 19 – Willson Contreras hits a home run on the first pitch of his first major-league at-bat becoming the 30th player in the Modern MLB Era to do so and the eighth player in Cubs history to homer in his first at-bat. June 22 – Miguel Montero leaves game after play at the plate with apparent right knee injury. The Cubs are swept by the Cardinals at Wrigley Field for the first time since 1988. June 27 – Kris Bryant becomes first player in MLB history to hit three home runs and two doubles in one game, going 5–5 in the game with six RBI's. His 16 total bases set a franchise record and he becomes the youngest player in club history to hit three home runs in the same game. June 28 – A game at Cincinnati went into extra innings as a 2–2 tie. By the end of the 12th inning, both teams had used up all their position players. The Cubs used three pitchers to play left field. Travis Wood entered the game in left in the 14th with Spencer Patton beginning the inning at pitcher. He retired the first batter and was sent to left field and Wood replaced him on the mound. Following a groundout, the two players switched positions again. After the Cubs took the lead in the 15th inning, Pedro Strop replaced Patton and played left field with Wood returning to pitch. Wood finished the game with 1 1/3 innings pitched, allowing one hit and striking out three. It was the first time since 1961 that three pitchers moved from the mound to outfield and back in the same game. The last time two pitchers did so was in 1986, when the visiting Mets switched Jesse Orosco and Roger McDowell against Cincinnati. In the 15th, Javier Baez hit a grand slam, his first career grand slam, which is the latest grand slam, by inning, in Cubs history. June 30 – Jon Lester is named National League Pitcher of the Month for June. The Cubs began July with the best record in baseball, 51–27, the best run differential at plus 169 and having a run of 10 consecutive months of at least .500 play. The pitching staff had the lowest ERA, the fewest hits allowed, runs allowed, earned runs allowed, and the lowest batting average by opponents in MLB. The Cubs offense when compared to all teams was second in on base percentage, second in base runners who eventually score, second in the number of RBI's and first in walks. Kris Bryant was tied with Todd Frazier of the Chicago White Sox and Mark Trumbo of the Baltimore Orioles for the Major League Home Run lead with 23 and was 4th with 61 RBI's. Anthony Rizzo had 60. The July 12th All-Star game in San Diego will begin with the entire Cubs infield (Bryant, Rizzo, Russell, and Zobrist) as starters. Rizzo led all National League players in votes. Zobrist beat out Daniel Murphy by 88 votes. Fowler, though injured, was the top vote getter for National League outfielders. Lester and Arrieta were also named to the team. July 3 – The Cubs are swept by the New York Mets. Cubs begin July 0–3 and losers of 10 of their last 14 games. July 10 – The Cubs enter the All-Star break at 53–35 having lost 15 out of their last 21 games. However, the Cubs' lead of seven games over St. Louis in the division is the largest lead in baseball. July 20 – The Mets and Cubs wear throwback uniforms in the series finale ahead of the weekend’s Hall of Fame inductions. Six other teams are also wearing vintage uniforms. July 20 – Rizzo homers twice in Cubs 6–2 win over the Mets giving him 24 on the season, one behind the National League lead of 25 by teammate Bryant. Kyle Hendricks' ERA is 2.27 which is third best in MLB behind Clayton Kershaw and Madison Bumgarner. July 22 – Dexter Fowler returns from the disabled list and leads off the game with a home run and drives in three runs as the Cubs beat the Milwaukee Brewers 5–2. July 27 – Addison Russell hits his first career grand slam as part of a five-run eighth inning as the Cubs defeat the Chicago White Sox 8–1. Javier Baez and Kris Bryant also homer as the Cubs snap a two-game losing streak. Bryant's homer, his 26th, ties his total home runs from last season. Newly acquired Aroldis Chapman pitches a perfect ninth inning. July 31 – The Cubs beat the Seattle Mariners 7–6 in 12 innings. In a game started by Brian Matusz, who departed after giving up six runs in three innings, the Cubs bullpen pitches nine innings of scoreless relief. Trailing 3–6 in the bottom of the ninth, the Cubs rallied to tie the game and force extra innings. Travis Wood again played left field after pitching in the sixth inning. He made a catch up against the wall in the seventh and returned to pitch in the eighth inning. Having exhausted all position players and bullpen pitchers, the Cubs were forced to have Jon Lester pinch hit in the bottom of the 12th after Jason Heyward doubled and moved to third on a Willson Contreras sacrifice fly. With two strikes, Lester executed a safety squeeze bunt and Heyward scored to win the game. The Cubs began August with the best MLB record of 63–41. The pitching staff once again had the lowest ERA, the fewest hits allowed, fewest runs allowed, fewest earned runs allowed, the lowest batting average by opponents in MLB and were among the leaders in fewest home runs allowed and in striking out opponent batters. The Cubs offense, when compared to all major league teams, was among the leaders in on-base percentage, base runners who eventually score, RBI's and drawing walks. Bryant and Rizzo were among the major league leaders in home runs and RBI's. August 1 – Kyle Hendricks throws a complete game shutout and lowers his ERA to 2.22, third best in the National League. His ERA at Wrigley Field this season is 1.19. August 3 – Cubs complete sweep of Miami Marlins with three-run ninth inning for the win. August 7 – Cubs beat Oakland A's 3–1 to sweep series and extend current winning streak to seven games. The win also puts the Cubs at a season-high 28 games over .500. August 8 – Kyle Hendricks is named National League Player of the Week for the first week of August. August 9 – Cubs defeat Angels 5–1, their eighth straight win, to become the first team to win 70 games. Bryant homers and drives in his 70th run becoming the first Cubs player ever to drive in 70 runs in each of his first two seasons. August 11 – Cubs defeat Cardinals 4–3 in 11 innings, their 10th straight win, on a walk-off walk. The win moved the Cubs to a season-high 13 game lead over the Cardinals in the NL Central. August 12 – Cubs defeat Cardinals 13–2, hitting five home runs and winning their 11th straight game. The lead in the NL Central increases to 14 games. The Cubs magic number to win the division stands at 34. August 18 – Cubs defeat the Brewers 9–6, completing a four-game sweep and move to a season-high 34 games over .500. Kris Bryant goes 5–5 with two home runs and five RBIs in the win. August 22 – Kyle Hendricks leads the Majors in ERA for pitchers with over 140 innings at 2.16. Jake Arrieta is fourth at 2.75 and Jon Lester is fifth at 2.81. Kris Bryant is the first player to score 100 runs this season. August 23 – With the Cubs 5–3 victory over the San Diego Padres, the Cubs moved to a season-high 35 games over .500 at 80–45. Their magic number to win the division moved 25. Jake Arrieta won his league-leading 16th game of the season and lowered his ERA to 2.62. Addison Russell hit his fifth home run in the last five games. The Cubs hit multiple home runs in their last seven games, the longest streak since the Cubs hit multiple home runs in an eight-game stretch from June 25 through July 2, 1961. August 29 – Following back-to-back road losses to the Los Angeles Dodgers, the Cubs returned home with a 14 game lead in the division and a 14.5 game lead over the Pittsburgh Pirates. The Cubs jumped out to a 3–0 lead early, but Jake Arrieta gave up the lead and trailed 6–3 in the eighth. Willson Contreras hit a two-run homer in the eighth and Jorge Soler tied with a homer in the ninth to send the game into extra innings. The Cubs won it in the 13th inning after giving up the go-ahead run in the top of 13th. They scored twice in the bottom of the 13th with a game-winning single by Miguel Montero. The Cubs magic number to win the division moved to 19 and their magic number to secure home-field advantage in the National League playoffs moved to 25. August 30 – Addison Russell's 84 RBIs are the most in one season by a Cubs shortstop since Ernie Banks in 1960. August 31 – Cubs complete three-game sweep of Pittsburgh Pirates, winning 6–5. The Cubs finished the month with 22 wins, the most wins in any month for the Cubs since 1945 when they went 22–10 in September of that year. The Cubs lead in the division moved to 15 games, a season high, and their largest first-place lead since the end of the 1907 season. The Cubs magic number moved to 16 as they moved to a season-high 38 games over .500. The Cubs record for the month of August was 22–6 and their overall record of 85–47 was the best in baseball. Their home record of 48–19 was the best in baseball. The pitching staff once again led the league with the lowest earned run average (ERA) of 3.13, fewest hits allowed at 926, fewest runs allowed at 450, fewest earned runs allowed at 415, the lowest batting average by opponents at .213, and were among the leaders in fewest home runs allowed and in striking out opponent batters. The Cubs offense, when compared to all major league teams, was among the leaders in on-base percentage, base runners who eventually score, runs batted in, and drawing walks. Kyle Hendricks' enters September with an earned run average of 2.09 in 159 innings pitched which leads all major league starting pitchers. Kris Bryant hit eight home runs and drove in 18 runs with a batting average of .456 and an on base percentage of .549 in his last 15 games. He had a post All-Star break batting average of .346. September 2 – Cubs beat Giants 2–1 to move to 40 games over .500. Jon Lester earned his 15th win of the seaon with a complete game three-hitter. The Cubs magic number was reduced to 14. September 5 – Cubs beat Brewers 7–2 to move to season-high 41 games over .500. Hendricks lowered his baseball-leading ERA to 2.07. The Cubs magic number was reduced to 10. September 9 – Cubs beat Astros 2–0 to win their 90th game of the season, the first team to win 90 games this year. The last time the Cubs were the first team to 90 wins was 1945, the last time the Cubs appeared in the World Series. Having finished the 2015 season with 97 wins, it was also the first time since 1928, 1929, and 1930 that the Cubs reached 90 wins in consecutive years. September 11 – Cubs beat Astros 9–5 to win series and reduce magic number to 5. September 12 – Cubs beat Cardinals 4–1, Hendricks loses no-hitter bid in the ninth after Jeremy Hazelbaker homered. Hendricks lowered his league-leading ERA to 2.03. The performance by Hendricks marked the 20th straight outing where he gave up three runs or less. The Cubs magic number was reduced to three. September 14 – Cubs defeat Cardinals 7–0 behind Jon Lester's eight innings of shutout ball. The win clinched a playoff birth for the Cubs as they were assured of at least a wild card berth. The magic number to clinch the division was reduced to one. September 15 – Cubs lose to the Brewers 5–4, but clinch the National League Central Division crown when the Cardinals lose to the Giants later that evening. This was the first time since 2008 that the Cubs had won the division. The Cubs were the first team to clinch their division and did so earlier than any other team since the 2008 Angels. September 19 – With homers by Willson Contreras, Addison Russell, and Jason Heyward, the Cubs beat Reds 5–2 and reduce magic number to guarantee home-field advantage in the playoffs to 5. September 21 – Cubs beat Reds 9–2 to sweep series and reduce magic number for home-field advantage to 2. September 23 – Cubs beat Cardinals 5–0 for their 98th win of the season, surpassing last year's total and marking the most wins for the Cubs since 1945. The win was also the 56th home victory, tying a team record. The Magic number for home-field advantage was reduced to 1. Following the Nationals' loss later that night, the Cubs clinched home-field advantage in the NL playoffs. September 25 – Cubs beat Cardinals 3–1 to win their 57th and final regular season game at Wrigley Field this year, breaking the team record from 1933 and 1935. The win also marked the team's 99th with of the season, the most wins by a Cubs' team since 1935. David Ross, in his last regular season home game prior to his retirement, was saluted by the crowd on several occasions and hit a solo home run, his tenth of the season. Ross became the ninth Cubs player with at least ten home runs on the season. Jon Lester recorded his 19th win of the season, the first NL pitcher to do so, while moving into second place in ERA with a 2.28 ERA (trailing only teammate Kyle Hendricks). September 26 – Cubs beat Pirates 12–2 to win their 100th game of the season, the first time they had won at least 100 games since 1935. Kyle Hendricks lowered his league-leading ERA to 1.99. Kris Bryant hit his career-high 39th home run of the season and has driven in 101 RBIs, also a career high. September 27 – Cubs beat Pirates 6–4 to win their 101st game of the season, the most wins by a Cubs team since 1910. With only two games left in the regular season, the Cubs finished September with a record of 102–57, the best record in baseball. The pitching staff approached the playoffs with three Cy Young Award candidates in Arrieta, Lester and Hendricks. The entire staff led major league baseball with the fewest hits, runs and earned runs allowed. They had the lowest opponent batting average and the lowest WHIP. October 2 – In the final regular season game, the Cubs rallied in the ninth inning to beat the Reds 7–4. The win marked the 103rd of the season for the Cubs, the most for the franchise since 1910. Kyle Hendricks gave up four runs in five innings of work, marking the first time in his last 23 starts he gave up more than three runs, but finished with a league-leading ERA of 2.13. At the conclusion of the regular season the pitching staff had a major league low team ERA of 3.15, the fewest runs allowed at 556, the fewest earned runs allowed at 511, the lowest batting average by opponents at .212 and were among the leaders in fewest home runs allowed and in striking out opponent batters. The Cubs offense, when compared to all major league teams, was among the leaders in on-base percentage (.343), base runners who eventually score (808), RBI's and drawing walks (656). Their run differential was +252. The Cubs had two serious MVP candidates in Kris Bryant and Anthony Rizzo and three possible Gold Glove winners. The Cubs began postseason play with starter Jon Lester on the mound facing Johnny Cueto for the Wild Card Game-winning Giants. In the pitching duel, Lester scattered five hits in eight innings of work, shutting out the Giants. Cueto also blanked the Cubs allowing only two hits prior to the eighth inning. In the eighth, Javier Baez hit a solo home run into the left field basket to put the Cubs up 1–0. Aroldis Chapman appeared for the save in the ninth and gave up a double to Buster Posey, but shut the Giants down as the Cubs took a 1–0 series lead. In game two of the series, the Cubs scored a run in the first inning on a Ben Zobrist single off former Cub Jeff Samardzija. Starting pitcher Kyle Hendricks had the key hit in the second inning, driving in two runs on a single up the middle. Kris Bryant drove in the Cubs' fourth run of the game two batters later and the Cubs led 4–0, forcing Samardzija from the game. In the top of the third, the Giants answered, scoring two runs on back-to-back doubles by Joe Panik and pinch-hitter Gregor Blanco and a sacrifice fly by Brandon Belt. Hendricks was hit in the arm by an Ángel Pagán line drive, forcing him to leave the game. Reliever Travis Wood ended the Giants' rally and, in the bottom half of the inning, hit a solo home run to put the Cubs up 5–2. The home run was the first by a relief pitcher in a postseason game since 1924. The Cub bullpen of Carl Edwards Jr., Mike Montgomery, and Héctor Rondón shut down the Giants for the remainder of the game with Chapman getting the save. The Cubs looked to finish the series sweep with Jake Arrieta facing the Giants' Madison Bumgarner in game three. The Giants looked to extend their streak to 10–0 in their last 10 elimination games. Arrieta hit a three-run homer in the top of the second, putting the Cubs up 3–0. The Cubs threatened to chase Bumgarner from the game in the third inning putting runners on first and second with only one out following singles by Ben Zobrist and Addison Russell. However, the Cubs failed to score and the Giants scored a run in the third following a Denard Span double and added a second run in the fifth following Span's triple. In the eighth inning, Travis Wood gave up a single and Héctor Rondón walked a batter. Closer Aroldis Chapman came in early to get a six-out save, but Chapman gave up a two-run triple to Conor Gillaspie to give the Giants' their first lead of the series. Chapman was lifted shortly thereafter, getting only one out. The Giants added another run on a single by Brandon Crawford. In the ninth, trailing 5–3, Dexter Fowler led off with a walk and Kris Bryant hit a two-run home run off Giants' closer Sergio Romo. Mike Montgomery, took over in the ninth for the Cubs and held the Giants scoreless for four innings. In the 13th inning, the Giants' Brandon Crawford doubled to lead off the inning and Joe Panik doubled him home to send the series to a game four. The Giants looked to continue their streak of wins in elimination games to 11 as the Cubs sent John Lackey to the mound against the Giants' Matt Moore. Lackey started off slow, allowing a leadoff double to Denard Span and a sacrifice fly by Buster Posey to give the Giants an early 1–0 lead. David Ross answered for the Cubs in the third with a solo home run to tie the game. The home run made Ross the oldest catcher ever to homer in a postseason game. However, Lackey got in trouble again in the fourth, giving up a run-scoring to single to Moore with the bases loaded and a force-out grounder by Span to put the Giants up 3–1. The Cubs bounced back with a run in the top of the fifth on a sacrifice fly by Ross. Justin Grimm relieved Lackey in the bottom of the fifth and surrendered a single to Posey and double that just missed being a home run by Brandon Crawford. Travis Wood entered and gave up a single to Conor Gillaspie and sacrifice fly to Joe Panik as the Giants surged to a 5–2 lead. Moore cruised through the next three innings, retiring the Cubs in order in the eighth before being lifted for the Giants' bullpen to start the ninth as it appeared a Game Five was inevitable. However, the Giants ended up using five pitchers in the inning as Kris Bryant singled, Anthony Rizzo walked, and Ben Zobrist doubled to score Bryant and tighten the game at 5–3. Cubs manager Joe Maddon decided to pinch hit for Addison Russell and his 95 RBIs with Chris Coghlan. Giants manager Bruce Bochy countered with lefty reliever Will Smith and Maddon used rookie catcher Willson Contreras instead. Contreras promptly singled up the middle to tie the game at five. Jason Heyward's attempted sacrifice bunt was too hard and Contreras was forced out at second, but gold-glove winner Crawford's throw to first ended up in the dugout allowing Heyward to reach second with one out. Javier Baez then singled up the middle to complete the comeback and give the Cubs the 6–5 lead. Aroldis Chapman struck out the side in the bottom of the ninth as the Cubs eliminated the Giants and moved on to the NLCS. The Cubs' comeback marked the biggest comeback in postseason-clinching history. Game 2 of the series featured the Dodgers' Clayton Kershaw off of his division series heroics and the Cubs' Kyle Hendricks. Kershaw was dominant from the start, pitching a perfect four innings before giving up a single by Javier Báez. However, the Cubs could get no further. Hendricks also pitched well, allowing a solo home run to Adrian Gonzalez in the top of the second inning. That would be all Kershaw needed as he pitched seven scoreless innings, scattering two hits. Dodgers' closer Kenley Jansen came in in the eighth to attempt a six out save. Jansen shut down the Cubs and the Dodgers tied the series at one game apiece heading back to Los Angeles. Cubs batters Addison Russell and Anthony Rizzo continued their struggles, each going 0–3 in the game. Combined, Ben Zobrist, Rizzo, and Russell are 6–60 in the playoffs. The game also marked the Cubs first 1–0 game in the postseason since Babe Ruth and the Boston Red Sox blanked them in the 1918 World Series opener at Comiskey Park (borrowed by the Cubs because of its larger seating capacity). As the series shifted to Los Angeles, the Cubs looked to break out of their hitting slump and sent Jake Arrieta to the mound, the Dodgers countered with Rich Hill. However, the Cubs' hitting problems continued as Hill shut them down, allowing only two hits in six innings of work. The Dodgers scored first in the third with a run-scoring single by Corey Seager. The Dodger offense also homered twice off of Arrieta: a two run homer by Yasmani Grandal in the fourth and a solo homer by Justin Turner in the sixth. The Dodger bullpen continued where Hill left off and the Dodger offense added two more runs in the bottom of the eighth to take a 6–0 lead. Kenley Jansen pitched four outs to earn his second consecutive save. The back-to-back shutouts were the Dodgers first ever consecutive shutouts in postseason history. The back-to-back shutouts marked the first time the Cubs had been shutout in back-to-back games since May 27–28, 2014. The Cubs hitting slump continued as the 2-3-4-5 hitters went 3–27 in the two shutouts. The win gave the Dodgers a 2–1 series lead. As the Cubs entered Game 4, they looked to break their two-game scoring drought. Playoff veteran John Lackey took the mound for the Cubs as the Dodgers sent Julio Urías, the youngest pitcher to start a game in postseason history. The Cubs struggles continued as Urías held the Cubs without a hit through three innings. In the bottom of the second, the Dodgers had a scoring chance denied as Adrian Gonzalez was thrown out at the plate by Jason Heyward after an Andrew Toles single. In the fourth, the Cubs bats began to awaken. Ben Zobrist notched the first Cub hit of the game as he bunted to lead off. Javier Báez and Willson Contreras followed with singles to score Zobrist. The run marked the first scored by the Cubs in 21 innings. A Heyward groundout pushed home another run and left Contreras at third for Addison Russell. On an 0–2 pitch, Russell broke out of his slump with a two-run homer to put the Cubs up 4–0. Urías was lifted one batter later. In the top of the fifth, the Cubs breakout continued with Anthony Rizzo hitting a home run on a full count and pushing the lead to 5–0. Back-to-back walks to lead off the bottom of the fourth forced Lackey from the game. Reliever Mike Montgomery gave up a single to load the bases before striking out Corey Seager. A single off of Montgomery's glove by Justin Turner brought in two runs and the Dodgers closed the lead to 5–2. Montgomery retired the next two batters to end the threat. In the top of the sixth, the Cubs blew the game open. Russell singled and reached second on a throwing error. Montgomery singled, moving Russell to third. Dexter Fowler singled to score Russell. Following a Kris Bryant walk, Rizzo notched his second hit of the game as he singled to score two runs and up the lead to 8–2. Following a single by Zobrist to load the bases, Báez hit a sacrifice fly to center fielder Joc Pedersen. Pedersen's throw to home got by the catcher as Bryant scored and Rizzo came home on the wild throw as well ballooning the lead to 10–2. The Cub bullpen shutdown the Dodgers for the remainder of the game as the series was tied at two games apiece. With the series tied at two games apiece, the Cubs looked to Jon Lester to keep up his strong playoff performance. The Dodgers also went with their Game 1 starter, Kenta Maeda. The Cubs started the scoring in the first inning on a single by Dexter Fowler and an RBI double by Anthony Rizzo, but could muster nothing further in the first. The Cubs left runners on base in the first, second, fourth, and fifth innings, but could not get another run in. The Dodgers tied the game in the bottom of the fourth following a Howie Kendrick double and steal of third. Adrian Gonzalez hit the ball to Rizzo who could not field it cleanly and the run scored as a result. The Dodgers lifted Maeda from the game in the fourth and turned it over to the bullpen. In the sixth, Javier Báez continued his strong postseason play by singling to start the inning. Following a strikeout of Jason Heyward, Addison Russell homered to center field to break the deadlock and put the Cubs up 3–1. After stranding two more runners in the seventh, the Cubs offense broke the game open in the eighth. Russell reached on error and pinch hitter Willson Contreras singled to put runners at first and second. Pinch hitter Albert Almora, Jr. bunted the runners over and Dexter Fowler following with an infield singled to score the Cubs' fourth run of the game. An infield single by Kris Bryant scored Contreras and walk by Ben Zobrist loaded the bases for Baez. Baez, as he had done all postseason, came through with a bases-clearing double to put the Cubs up 8–1. The Dodgers added a run in the bottom of the eighth off of Pedro Strop on a double Carlos Ruiz. Cub closer Aroldis Chapman pitched the ninth and allowed a run-scoring single by Josh Reddick and a sacrifice fly by Andrew Toles to make the score 8–4. Chapman induced Justin Turner to ground out to end the game. The win put the Cubs on the brink of the World Series with a three games to two lead as the series moved back to Wrigley Field. The Cubs took advantage of the Dodgers bullpen in the series, scoring 26 runs in 26.2 inning pitched by Maeda and the Dodger bullpen. As the series returned to Wrigley Field, the Cubs looked to earn a trip to the World Series for the first time since 1945. The Cubs sent ERA-leader Kyle Hendricks to the mound while the Dodgers countered with Clayton Kershaw. On the first pitch of the game, Andrew Toles singled for the Dodgers and the game appeared to be off to a good start for the Dodgers. However, Corey Seager swung at the next pitch and grounded to Javier Báez who tagged Toles and threw to first to complete the double play. In the bottom of the first, the Cubs jumped out quickly on Kershaw who had blanked them in Game 2. Dexter Fowler doubled and Kris Bryant singled him home to give the Cubs a 1–0 lead. Anthony Rizzo reached on an error by Toles and with runners at second and third, Ben Zobrist hit a sacrifice fly to extend the lead to 2–0. In the top of the second, Josh Reddick reached on an error by Báez, but Hendricks picked him off of first to end the inning. The Cubs added another run in the bottom of the second when Addison Russell doubled to left and scored on Fowler's single. In the bottom of the fourth, Willson Contreras led off the inning by homering on a line drive to left field to extend the lead to 4–0. In the fifth, Rizzo continued his hot hitting by homering to right center field and putting the Cubs up 5–0. Kershaw was lifted after that inning, but Hendricks continued his gem on the mound, retiring the side and facing the minimum batters through seven innings. In the eighth, after a flyout by Adrian Gonzalez, Reddick singled, only the second hit allowed by Hendricks. That ended the night for Hendricks as Cub manager Joe Maddon went to the bullpen and brought in closer Aroldis Chapman. Chapman induced Howie Kendrick into an inning-ending double play. In the top of the ninth, Chapman walked the second batter, but Yasiel Puig grounded into a game-ending double play as Wrigley Field erupted in celebration. The Cubs advanced to their first World Series since 1945 with the 5–0 win and the four games to two series win. In the game, the Cubs faced the minimum amount of batters, 27, in a game. The only other time that had occurred in a postseason game was Don Larsen's 1956 perfect game for the Yankees. Jon Lester and Javier Báez were named co-MVPs of the NLCS. To begin the historic World Series, the teams sent their number one starters to the mound in Cleveland: Corey Kluber for the Indians and Jon Lester for the Cubs. The Cubs altered their lineup a bit, batting Kyle Schwarber, making his first appearance in six months, as their DH. Things started well for Lester as he retired the first two batters he faced. However, Francisco Lindor singled and stole second with two outs. Lester then walked Mike Napoli and Carlos Santana. With the bases loaded, José Ramírez hit an infield single to drive in a run and Lester hit the next batter, Brandon Guyer, to give the Indians a 2–0 lead. Kluber started hot as well, striking out eight of the first nine batters he faced, a World Series record. In the bottom of the fourth, Roberto Pérez homered to left off of Lester increasing the lead. Kluber continued his excellent performance, striking out nine before giving up a double to Ben Zobrist in the top of the seventh which ended Kluber's night and brought Andrew Miller to the mound. Schwarber walked and Javier Baéz singled to load the bases. However, Miller induced a shallow fly ball by pinch hitter Willson Contreras and struck out Addison Russell and David Ross to end the Cub threat. With Justin Grimm pitching for the Cubs in the bottom of the eighth, the Indians put runners on first and second and Héctor Rondón gave up another home run to Pérez to put the game out of reach 6–0. The win put the Indians up one game and Terry Francona's World Series winning streak reached nine with this victory. 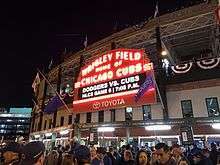 The series shifted to Wrigley Field for the first World Series game at Wrigley since 1945, and the first World Series night game. Josh Tomlin went to the mound for Cleveland and Kyle Hendricks for Chicago. Both pitchers pitched well, but Hendricks was in and out of trouble frequently giving up six hits, and walking two in just four and a third innings. Following a single by Tyler Naquin, a bunt by Tomlin, a walk to Carlos Santana, Hendricks hit Jason Kipnis with a pitch to load the bases in the fifth. Justin Grimm relieved Hendricks and got Francsico Lindor to hit into an inning-ending double play escaping with the score still 0–0. The Cubs chased Tomlin from the game in the bottom of the fifth, but Andrew Miller replaced him and retired pinch-hitter Miguel Montero. Leading off the seventh, Roberto Perez singled to right off reliever Carl Edwards Jr. Pinch runner Michael Martinez replaced him at first. Naquin advanced Martinez to second with a bunt and Martinez moved to third on a wild pitch by Edwards. After Rajai Davis walked, pinch-hitter Coco Crisp hit a broken bat single to right to score Martinez. Mike Montgomery replaced Edwards and escaped the inning without any further damage. In the bottom of the seventh, the Cubs threatened to tie it with a two-out triple by Jorge Soler, but Javier Báez grounded out to end the inning. In the ninth, the Cubs again threatened to tie it, putting runners on second and third following singles by Anthony Rizzo and Jason Heyward. However, with two outs, Báez struck out swinging to end the game. The win gave the Indians a 2–1 lead in the series. Cody Allen had his sixth save this postseason. With the series lead, the Indians sent Corey Kluber to the mound on short rest against John Lackey to try to extend the series lead to three games to one. The Cubs opened the scoring in the first inning with a double by lead-off man Dexter Fowler and a run-scoring single by Anthony Rizzo. However, the Indians quickly answered in the top of the second as Carlos Santanta homered to tie it. Following an error by Kris Bryant and an intentional walk of Tyler Naquin, Kluber singled home the go-ahead run giving the Indians the 2–1 lead. The Indians added another run in the third when Francisco Lindor singled home Jason Kipnis to increase the lead to 3–1. Kluber continued to shut down the Cubs as he did in game one. Lackey was lifted after five innings, but reliever Mike Montgomery gave up another run in the sixth as the Indians lead moved to 4–1. Cleveland put the game away in the seventh on a three-run homer by Jason Kipnis off of Travis Wood, pushing the lead to 7–1. Fowler hit a consolation eighth inning solo home run off of reliever Andrew Miller, but that was it as the Cubs lost 7–2 and fell behind in the series three games to one. Facing elimination and the last game at Wrigley Field for the season, the Cubs sent ace Jon Lester to the mound while the Indians countered with Trevor Bauer. Lester surrendered a second inning homer to Jose Ramirez as the Cubs fell behind 1–0. However, Kris Bryant answered in the fourth homering to left to lead off the inning. Anthony Rizzo doubled following Bryant's homer and Ben Zobrist singled. Addison Russell followed with an infield single to score Rizzo and put the Cubs up 2–1. Following a Jason Heyward strikeout, Javier Báez singled on a bunt to load the bases with one out. David Ross hit a sacrifice fly to score Zobrist, but Lester struck out to end the inning. Bauer was removed from the game after pitching four innings, but the Cubs could do no further damage. Leading 3–1, Lester allowed a run in the sixth following a single and stolen base by Rajai Davis and a Francisco Lindor single. Lester was lifted with the 3–2 lead after six innings. Carl Edwards Jr. replaced Lester in the seventh and gave up a single. Following a flyout, Cub manager Joe Maddon went to closer Aroldis Chapman for an eight-out save. Chapman closed out the seventh and gave up a single to Davis in the eighth. Davis stole second and third, but Chapman stranded him there. In the ninth, Chapman retired the side, striking out José Ramírez to end the game and extend the series to a game six in Cleveland. The series returned to Cleveland with the Cubs looking to force a seventh game while the Indians looked to win the series. Cubs starter Jake Arrieta took the mound for the Cubs while Josh Tomlin took the hill for the Indians. The game started well for the Indians as Tomlin retired the first two batters easily and moved to an 0–2 count on Kris Bryant. However, Bryant drove Tomlin's next pitch over the left field wall to give the Cubs an early 1–0 lead. Anthony Rizzo followed the homer with a single and Ben Zobrist singled to move Rizzo to third. Addison Russell hit a fly ball to right center that ended up falling between the Indians outfielders scoring Rizzo. Zobrist also scored on the play knocking over Indians catcher Roberto Pérez to give the Cubs an early 3–0 lead. Arrieta cruised through the first two innings for the Cubs. In the third, Kyle Schwarber led off the inning with a walk. Bryant flied out and Rizzo singled. Zobrist singled again to load the bases and chase Tomlin from the game. Dan Otero, replacing Tomlin, pushed Russell to an 0–2 count before Russell belted a homer to deep left center field for a grand slam. The Cubs lead ballooned to 7–0 and a seventh game seemed likely. In the fifth, Arrieta allowed a double to Jason Kipnis and he scored on a Mike Napoli single to reduce the lead by one. In the fifth, Kipnis further reduced the lead with a solo home run to left putting the Cubs up 7–2. Following a walk by Arrieta in the sixth, Mike Montgomery replaced him on the mound to induce a groundout to end the inning. In the seventh, Montgomery walked Pérez and gave up a Kipnis single with two outs. Cubs manager Joe Maddon again called on Cub closer Aroldis Chapman and he induced a groundout by Francisco Lindor to end the inning. Chapman gave up a single in the eighth, but got a double play to end the inning. In the ninth, with two outs, Bryant singled for his fourth hit of the game. Rizzo homered to push the Cub lead back to seven at 9–2. On the verge of pushing the series to a seventh game, Chapman walked the first batter and was replaced by Pedro Strop. After giving up a run-scoring single to Pérez and walking Carlos Santana, Travis Wood entered to get the final out and force a game seven in the series. With the series tied at three games apiece, the Cubs sent regular season ERA leader Kyle Hendricks to the mound. The Indians countered with Corey Kluber, winner of games one and four. Things started well for the Cubs as Dexter Fowler led off the game with a home run to straight away center to give the Cubs an early 1–0 lead. Hendricks held the Indians scoreless until the third when Coco Crisp doubled, was moved to third on a sacrifice bunt by Roberto Pérez, and scored on a single by Carlos Santana. The Cubs jumped back out in front in the fourth when Kris Bryant singled, Anthony Rizzo was hit by a pitch, and Ben Zobrist forced Rizzo at second. Addison Russell hit a shallow fly ball to left field which allowed Bryant to tag and score to put the Cubs up 2–1. Willson Contreras followed the sacrifice fly with a double to right center field to score Zobrist and the Cubs were up 3–1. The lead increased in the fifth when Javier Báez homered on the first pitch of the inning to drive Kluber from the game. Andrew Miller, who had dominated the postseason, entered the game. Following a single by Fowler, Kyle Schwarber grounded in to a double play and Miller looked to have escaped the inning. But, Bryant coaxed a walk on a nine-pitch at bat and scored from first on a single to right by Rizzo to make the lead 5–1. Hendricks, who had seemingly settled down, got the first two outs in the bottom of the fifth, but walked Santana. Cub manager Joe Maddon pulled Hendricks to be replaced by game one and five starter, Jon Lester. Lester allowed a dribbler in front of the plate by Jason Kipnis, but David Ross, who had entered the game with Lester and was playing in his final major league game, threw wildly to first allowing runners to advance to second and third. Lester uncorked a wild pitch that bounced off Ross's mask and scored both runners, tightening the lead to 5–3. Ross partially atoned for the error in the sixth with a homer to center field to bring the lead to 6–3. Lester allowed runners in the sixth and the seventh, but held the Indians without a run. In the eighth, after retiring the first two batters, Lester allowed a single up the middle to José Ramírez. Maddon had seen enough and brought Aroldis Chapman, pitching in his third straight game, into the contest. Brandon Guyer promptly doubled to score Ramirez and reduce the lead to two. Rajai Davis then stunned the Cubs by homering to left to tie the game at six. In the ninth, Ross walked and was pinch run for by Chris Coghlan. Jason Heyward grounded into a force play, but then stole second and advanced on a bad throw by Yan Gomes. With two strikes, Báez attempted to bunt, but fouled out. Fowler grounded out to end the threat. Surprisingly, Chapman returned to the mound in the ninth and retired the Indians in order to force extra innings. However, before the tenth inning could start, a 17 minute rain delay occurred. Schwarber singled upon resumption of play and was pinch run for by Albert Almora Jr. Almora advanced to second on a sacrifice fly by Bryant and the Indians chose to walk Rizzo to face Zobrist. Zobrist doubled down the left field line off Bryan Shaw to score Almora. Shaw then intentionally walked Russell to load the bases. Miguel Montero, in the game after Ross was lifted for a pinch runner, scored Rizzo on a single up the middle to move the lead to 8–6. Game two and five starter Trevor Bauer then retired Heyward and Báez to end the inning. Carl Edwards, Jr. was called on by Maddon to end the Cubs World Series drought. Edwards retired the first two batters, but walked Guyer. Davis followed up his game-tying homer by singling to score Guyer and reduce the lead to one. With the Indians out of position players, Michael Martínez, who had entered the game as a defensive replacement, came to the plate with two outs. Maddon countered with Mike Montgomery. On the second pitch by Montgomery, Martínez hit a soft grounder to Bryant who threw to first to end the game, series, baseball season, and their 108-year "curse". Zobrist, who batted .357 in the series and led all players with 10 hits, was named World Series MVP. Many baseball sources have called this game "one of the greatest Game 7's ever played." Winning player's share: $TBD. Losing player's share: $TBD. ↑ Jackie Robinson's rookie season was 1947 which was two years after the Chicago Cubs appearance in the 1945 World Series. In 1953, Ernie Banks, known as Mr. Cub, became the first African-American on the Cubs roster. ↑ "Uni Watch: 2016 MLB season preview". ESPN.com. Retrieved 2016-04-21. ↑ Rogers, Jesse (2015-11-19). "Cubs sign RHP Andury Acevedo, Rule 5 deadline approaches". ESPN. Retrieved 2015-12-09. ↑ Hellman, Aaron. "Ryan Cook: The quiet move that just makes sense". cubsgeek.com. Cubs Geek. Retrieved 19 November 2015. ↑ "Cubs claim Jack Leathersich off waivers from Mets". SB Nation. 2015-11-19. Retrieved 2015-12-09. 1 2 3 4 Muskat, Carrie (2015-11-20). "Cubs protect 4 prospects from Rule 5 draft". Chicago Cubs. Retrieved 2015-12-02. ↑ Gonzales, Mark (2015-11-20). "Cubs acquire reliever Spencer Patton from Rangers". Chicago Tribune. Retrieved 2015-12-09. 1 2 "Cubs Non-Tender 2, Sign 2, Tender Contracts To 6 More". SB Nation. 2015-12-02. Retrieved 2015-12-09. ↑ Gonzalez, mark. "Cubs, John Lackey agree to 2-year contract". chicagotribune.com. The Chicago Tribune. Retrieved 16 February 2016. ↑ Gleeman, Aaron. "Cubs release Brendan Ryan one week after trading for him". mlb.nbcsports.com. NBC Sports. Retrieved 24 December 2015. ↑ "Cubs, Ben Zobrist agree to terms on 4-year deal worth $56M". espn.com. ESPN. Retrieved 16 February 2016. ↑ Kruth, Cash (2015-12-15). "J-Hey officially joins Cubs' young core". MLB.com. Retrieved 2015-12-15. ↑ "Cubs Claim Orioles Reliever C.J. Riefenhauser". chicago.suntimes.com. Chicago SunTimes. ↑ Rogers, Jesse. "Dexter Fowler re-signs with Cubs, surprises teammates". espn.go.com. ESPN. ↑ Thele, Kyle. "Cubs make their radio move to WSCR official". chicago.suntimes.com. Chicago Sun-Times. Retrieved 1 February 2016. ↑ Todd, Jeff (April 8, 2016). "Kyle Schwarber Out For Year With Torn Knee Ligaments". mlbtraderumors.com. Retrieved April 8, 2016. ↑ "Cubs' Kyle Schwarber: Officially placed on DL". CBSSports.com. Retrieved 2016-07-11. ↑ "Entertaining Kawasaki back with Iowa Cubs". Retrieved 2016-07-11. ↑ "Cubs catcher Montero to DL with back tightness". ESPN.com. Retrieved 2016-04-28. ↑ "Cubs Place Matt Szczur On DL, Call Up Ryan Kalish". Retrieved 2016-05-03. ↑ "Hector Rondon available to pitch for Cubs". Chicago Cubs. Retrieved 2016-05-11. ↑ "Montero activated by Cubs, hitless in return". ESPN.com. Retrieved 2016-05-23. ↑ "Cubs Sign Joe Nathan". MLB Trade Rumors. Retrieved 2016-05-23. ↑ Yellon, Al (2016-05-21). "Cubs Roster Moves: Matt Szczur Activated, Neil Ramirez DFA, No DL For Jason Heyward". Bleed Cubbie Blue. Retrieved 2016-05-23. ↑ "Cubs put OF Jorge Soler on DL with hamstring injury; Albert Almora called up". WGN-TV. 2016-06-07. Retrieved 2016-06-07. ↑ Rogers, Jesse. "What it means: Cubs reacquire Chris Coghlan from the A's". espn.go.com. ESPN.go.com. Retrieved 10 June 2016. ↑ "Cubs' Tommy La Stella: Placed on DL". CBSSports.com. Retrieved 2016-06-10. ↑ "Cubs' Joel Peralta: Signs minor league deal with Cubs on Thursday". CBSSports.com. Retrieved 2016-06-10. ↑ "Cubs claim hard-throwing RP R.J. Alvarez". www.chicagonow.com. Retrieved 2016-06-13. ↑ "Cubs Sign Brian Matusz To Minor-League Deal - TKB". Today's Knuckleball. 2016-06-14. Retrieved 2016-06-15. ↑ "Reports: Cubs call up top prospect Contreras". ESPN.com. Retrieved 2016-06-17. ↑ "Willson Contreras' progress encourages Cubs player development guru". ESPN.com. Retrieved 2016-06-17. ↑ "Cubs CF Fowler placed on DL for hamstring injury". ESPN.com. Retrieved 2016-06-21. ↑ "Report: Cubs reliever headed to the DL - CubsHQ.com". CubsHQ.com. 2016-06-21. Retrieved 2016-06-21. ↑ "Cubs Call Up Reliever Joel Peralta". Retrieved 2016-07-01. ↑ Tribune, Chicago. "Cubs place David Ross on DL, Joel Peralta off roster". Retrieved 2016-07-06. ↑ "Cubs recall Munenori Kawasaki, send Jeimer Candelario back to Triple-A". 2016-07-09. Retrieved 2016-07-11. ↑ "Fan favorite Kawasaki sent back to the minors - CubsHQ.com". 2016-07-11. Retrieved 2016-07-12. ↑ "Mark Gonzales on Twitter". Retrieved 2016-07-15. ↑ "Iowa Cubs game notes". MiLB.com. MiLB.com. Retrieved 21 July 2016. ↑ "Cubs boost bullpen, trade for lefty Montgomery". Retrieved 2016-07-21. ↑ "Looks Like Spencer Patton is Headed Back to Iowa to Accommodate Mike Montgomery". Bleacher Nation | Unofficial Chicago Cubs News, Rumors, and Commentary. 2016-07-22. Retrieved 2016-07-22. ↑ "Cubs' Dexter Fowler: Activated, leading off Friday". CBSSports.com. Retrieved 2016-07-22. ↑ "Carrie Muskat on Twitter". Retrieved 2016-07-24. ↑ "Cubs acquire Aroldis Chapman from Yankees". Chicago Cubs. Retrieved 2016-07-25. ↑ "Cubs Designate Clayton Richard For Assignment". MLB Trade Rumors. Retrieved 2016-07-29. ↑ "Carrie Muskat on Twitter". Retrieved 2016-07-29. ↑ Tribune, Chicago. "Cubs activate Chris Coghlan, option Tommy La Stella". Retrieved 2016-07-29. ↑ "Chicago Cubs on Twitter". Retrieved 2016-07-31. ↑ "Jesse Rogers on Twitter". Retrieved 2016-08-01. ↑ "Carrie Muskat on Twitter". Retrieved 2016-08-01. ↑ Yellon, Al (2016-08-02). "Cubs Roster Moves: Joe Smith Added, Spencer Patton To Iowa". Bleed Cubbie Blue. Retrieved 2016-08-03. ↑ "Carrie Muskat on Twitter". Retrieved 2016-08-03. ↑ Tribune, Chicago. "Cubs option Justin Grimm to make room for Jason Hammel". Retrieved 2016-08-09. ↑ "Jesse Rogers on Twitter". Retrieved 2016-08-11. ↑ Xchange, By The Sports. "Cubs activate RHP Cahill". Retrieved 2016-08-16. ↑ Tribune, Chicago. "Cubs place Joe Smith on DL due to hamstring strain". Retrieved 2016-08-17. ↑ "Chris Coghlan to the DL, Spencer Patton Called Up". Bleacher Nation | Unofficial Chicago Cubs News, Rumors, and Commentary. 2016-08-17. Retrieved 2016-08-18. ↑ "Jesse Rogers on Twitter". Retrieved 2016-08-19. ↑ "Carrie Muskat on Twitter". Retrieved 2016-08-31. ↑ "Carrie Muskat on Twitter". Retrieved 2016-09-01. ↑ "Cubs activate John Lackey from disabled list - CubsHQ.com". 2016-09-04. Retrieved 2016-09-06. ↑ "ROSTER MOVES: Rondon, Almora, Patton, Federowicz, and Kawasaki Return". Bleacher Nation | Unofficial Chicago Cubs News, Rumors, and Commentary. 2016-09-06. Retrieved 2016-09-06. ↑ "Chicago Cubs on Twitter". Retrieved 2016-09-06. ↑ "Cincinnati Reds vs Chicago Cubs - Recap April 14, 2016 | SI.com". www.si.com. Retrieved 2016-04-22. ↑ "Schwarber out for season with torn ACL, LCL". ESPN.com. Retrieved 2016-04-22. ↑ "Arrieta claims second no-no in 16-0 rout of Reds". ESPN.com. Retrieved 2016-04-22. ↑ "'3 a.m.' Tommy La Stella one of many Cubs heroes in another rout of Reds". ESPN.com. Retrieved 2016-04-25. ↑ "All-time winners". m.mlb.com/awards. MLB.com/Awards. Retrieved 14 June 2016. ↑ "Cubs OF Heyward day-to-day with injured wrist". ESPN.com. Retrieved 2016-05-03. ↑ "Heyward (wrist), Szczur (hamstring) add to Cubs OF injury woes". Chicago Sun-Times. Retrieved 2016-05-03. ↑ "Jake Arrieta Named National League Pitcher of the Month for April | Chicago Cubs Online". Chicago Cubs Online. 2016-05-03. Retrieved 2016-05-04. ↑ "Cubs' David Ross On Throwing Out 4 Brewers: 'Got A Couple Bullets' Left". chicago.cbslocal.com. CBS CHGO. Retrieved 22 May 2016. ↑ Eymer, Rick. "Heyward injured making spectacular catch". mlb.com. mlb.com. Retrieved 22 May 2016. ↑ "Cubs 'dodge bullet' as Heyward returns to lineup". ESPN.com. Retrieved 2016-06-02. ↑ Hedger, Brian. "Cubs 1-hit LA with 7 innings of perfect relief". mlb.com. Retrieved 31 May 2016. ↑ "Chicago Cubs". espn.go.com. ESPN. Retrieved 4 June 2016. ↑ Wittenmyer, Gordon. "For starters, Cubs rotation might have stuff of finishers". chicagosuntimes.com. Chicago Sun Times. Retrieved 7 June 2016. ↑ "The Cubs are dominating NL All-Star vote like they're the Royals". Yahoo Sports. Retrieved 2016-06-02. ↑ "Lester 4-hits Dodgers as Cubs win 2-1". Yahoo Sports. Retrieved 2016-06-02. ↑ "The top four NL All-Star vote-getters are Cubs". CSN Chicago. 2016-06-08. Retrieved 2016-06-13. ↑ "Arrieta gets win No. 10 as Cubs beat Braves". Daily Herald. Associated Press. 11 June 2016. Retrieved 12 June 2016. ↑ Muskat, Carrie. "Lester earns NL Player of the Week honors". m.cubs.mlb.com. MLB.com/Cubs. Retrieved 14 June 2016. ↑ "Contreras becomes 8th Cub to homer in first career at-bat". WGN-TV. 2016-06-20. Retrieved 2016-06-20. ↑ "Miguel Montero Leaves Game with Right Knee Issue". Retrieved 2016-06-22. ↑ "Cubs Swept By Cardinals In 7-2 Loss". Retrieved 2016-07-01. ↑ Gonzales, Mark. "Cubs' Kris Bryant first in MLB history to hit 3 home runs, 2 doubles in game". www.chicagotribune.com. Chicago Tribune. Retrieved 29 June 2016. 1 2 "The week in interesting and unusual Cubs stats". Retrieved 2016-07-01. ↑ Pace, Cody (June 29, 2016). "Cubs try every trick in the book in wild win: With all position players used, Maddon improvises in Chicago's victory". MLB.com/Cubs. Retrieved June 29, 2016. ↑ Goheen, Kevin; Pace, Cody (June 29, 2016). "Kiss it good Baez! In 15, Cubs slam door". MLB.com/Cubs. Retrieved June 29, 2016. ↑ "Sortable Team Stats". chicago.cubs.mlb.com. MLB.com. Retrieved 3 July 2016. ↑ "Cubs make history as All-Star rosters are named". Retrieved 2016-07-06. ↑ "Daniel Murphy misses out on being an All-Star starter by only 88 votes". CBSSports.com. Retrieved 2016-07-06. ↑ "Look familiar? Cubs swept by Mets in NLCS rematch". Retrieved 2016-07-04. ↑ "Standings on Tuesday, July 12, 2016 | Baseball-Reference.com". Baseball-Reference.com. Retrieved 2016-07-20. ↑ "Conforto's transition to center will have to wait". Retrieved 2016-07-20. ↑ "Rizzo homers twice off Colon; Hendricks, Cubs top Mets 6-2". Retrieved 2016-07-20. ↑ "Fowler returns with a homer, Cubs down Brewers 5-2". Retrieved 2016-07-28. 1 2 "Baez's Homer, Russell's Grand Slam Help Cubs Bust It Open In 8-1 Win Over White Sox". Retrieved 2016-07-28. ↑ "Lester squeezes in deciding run, Cubs beat Mariners in 12". Retrieved 2016-08-02. ↑ Sports, Fox. "Jon Lester bunts in deciding run, Cubs beat Mariners in 12 innings". Retrieved 2016-08-02. ↑ "Mariners blow 6-run lead, lose 7-6 to Cubs in 12 innings". Washington Post. Retrieved 2016-08-02. 1 2 "Kyle Hendricks emerging as a star for Cubs". Retrieved 2016-08-02. ↑ "Marlins vs. Cubs | 08/03/16". Major League Baseball. Retrieved 2016-08-03. 1 2 "Two homers, Kyle Hendricks lead Cubs to win". Major League Baseball. Retrieved 2016-08-08. ↑ Gonzales, Mark. "Cubs' Kyle Hendricks shares NL Player of Week honors with Ichiro Suzuki". www.chicagotribune.com. Chicago Tribune. Retrieved 9 August 2016. 1 2 "Cubs hit the 70-win mark faster than most of their predecessors". Retrieved 2016-08-10. ↑ "Cubs beat Cardinals, win 10th straight game". Major League Baseball. Retrieved 2016-08-12. ↑ "Cardinals vs. Cubs | 08/12/16". Major League Baseball. Retrieved 2016-08-12. ↑ "The Chicago Cubs Magic Number". www.cubsmagicnumber.com. Retrieved 2016-08-12. ↑ "MLB Player Pitching Stats - 2016". espn.com. ESPN.com/MLB. Retrieved 23 August 2016. ↑ "Arrieta Dominates For 8 Innings, Cubs Beat Padres 5-3". Retrieved 2016-08-24. ↑ "No doubt, Addison Russell is becoming a star for Cubs". 2016-08-24. Retrieved 2016-08-24. ↑ "Cubs hit 2 homers to back Arrieta's 16th win". Major League Baseball. Retrieved 2016-08-24. ↑ "Cubs outlast Pirates to win wacky, extra-inning affair". Retrieved 2016-08-30. ↑ "Elias Sports Bureau on Twitter". Retrieved 2016-09-01. ↑ "Cubs sweep Pirates with 6-5 victory". Retrieved 2016-09-01. ↑ "ESPN Stats & Info on Twitter". Retrieved 2016-09-01. ↑ "Bryant named NL Player of the Month, Hendricks named NL Pitcher of the Month". wgntv.com. WGN TV. Retrieved 6 September 2016. 1 2 The Associated Press (2016-09-05). "Hendricks, Late Hits Lift Cubs Over Brewers 7-2". The New York Times. ISSN 0362-4331. Retrieved 2016-09-06. 1 2 "The Cubs are the first team to 90 wins in 2016". Retrieved 2016-09-12. ↑ "Cubs back Arrieta to win series vs. Astros". Major League Baseball. Retrieved 2016-09-12. 1 2 3 "Hendricks' gem drops Cubs' magic number to 3". Chicago Cubs. Retrieved 2016-09-13. ↑ "Anthony Rizzo's 2 HRs help Cubs beat Cardinals, clinch playoff spot". Retrieved 2016-09-15. ↑ "Brewers crash Cubs' party with 5-4 win at Wrigley Field". Retrieved 2016-09-20. 1 2 "Cubs capture first NL Central title since 2008". Retrieved 2016-09-20. ↑ Staff, Athletic. "Lose and they're in: Cubs clinch division title for first...". The Athletic. Retrieved 2016-09-20. ↑ Tribune, Chicago. "Cubs get late power surge, beat Reds with eye toward preparing for playoffs". Retrieved 2016-09-20. ↑ "Stephenson knocked out early as Cubs sweep Reds". Retrieved 2016-09-23. ↑ "Cubs down Cardinals 5-0 for 98th win". WGN-TV. 2016-09-23. Retrieved 2016-09-23. ↑ Tribune, Chicago. "Cubs clinch home-field advantage throughout National League playoffs". Retrieved 2016-09-26. ↑ Tribune, Chicago. "Sunday's recap: Cubs 3, Cardinals 1". Retrieved 2016-09-26. ↑ "David Ross, Jon Lester lead Cubs' 99th win". Chicago Cubs. Retrieved 2016-09-26. ↑ "Cubs Win 100 Games for First Time Since 1935". Retrieved 2016-09-27. 1 2 Tribune, Chicago. "Kyle Hendricks extends mastery, Kris Bryant tops 100 RBIs in Cubs' 100th win". Retrieved 2016-09-27. ↑ Sports, Fox. "Cubs continue dominance of Pirates in 6-4 win (Sep 27, 2016)". Retrieved 2016-09-28. ↑ "Cubs-Pirates game suspended, ends in tie". Major League Baseball. Retrieved 2016-09-30. ↑ "Sortable Team Stats". chicagocubs.mlb.com. MLB.com. Retrieved 2 October 2016. 1 2 "Cubs rally in 9th to beat Reds 7-4 for 103rd win of season". WGN-TV. 2016-10-02. Retrieved 2016-10-03. 1 2 Collier, Jamal (October 25, 2016). "Fowler Cubs' first African-American in Series: Center fielder will be first up in Game 1; Heyward, Edwards, Russell also honored by distinction". mlb.com. Retrieved October 25, 2016. 1 2 Muskat, Carrie (October 25, 2016). "Cubs set roster for World Series vs. Indians: Schwarber returns after missing nearly all of season with knee injuries". mlb.com. Retrieved October 26, 2016. 1 2 "Box Score: Game 1, 2016 World Series". Gameday. mlb.com. October 25, 2016. Retrieved October 26, 2016. ↑ "Cubs win NLDS G1 over Giants on Javier Baez HR". Chicago Cubs. Retrieved 2016-10-10. 1 2 "Cubs take 2-0 lead on Giants in NLDS". Major League Baseball. Retrieved 2016-10-10. ↑ "Giants storm back to beat Cubs in 13 innings, stave off elimination in NLDS". USA TODAY. Retrieved 2016-10-11. ↑ Tribune, Chicago. "Cubs fail to complete sweep, blowing 3-run lead in 13-inning loss to Giants". chicagotribune.com. Retrieved 2016-10-11. ↑ "Giants top Cubs in 13 innings to stay alive". Retrieved 2016-10-11. 1 2 "Cubs-Giants Game 4: Final score, things to know as Cubs advance to NLCS after furious comeback". CBSSports.com. Retrieved 2016-10-12. ↑ Witz, Billy (2016-10-12). "Cubs Oust Giants to Reach N.L.C.S., for Once on Good Side of a Big Rally". The New York Times. ISSN 0362-4331. Retrieved 2016-10-12. 1 2 "Cubs rally to defeat Giants, advance to NLCS". Major League Baseball. Retrieved 2016-10-12. ↑ "Montero's pinch-hit slam lifts Cubs over Dodgers 8-4". ESPN.com. Retrieved 2016-10-17. ↑ "Dodgers-Cubs Game 1: Final score, things to know as Cubs win NLCS opener". CBSSports.com. Retrieved 2016-10-17. ↑ "MLB Playoffs: The Cubs' biggest problem has been exposed". foxsports.com. Retrieved 2016-10-17. ↑ "Kershaw helps Dodgers blank Cubs 1-0, NLCS even at 1-all". The Big Story. Retrieved 2016-10-18. 1 2 Mitrosilis, Teddy. "The Dodgers made history by owning the Cubs in Game 3". FOX Sports. Retrieved 2016-10-19. ↑ "Cubs-Dodgers Game 3: Final score, things to know as Dodgers take 2-1 series lead". CBSSports.com. Retrieved 2016-10-19. ↑ "Mexican pitcher Julio Urias is the youngest in MLB postseason history". NBC News. Retrieved 2016-10-20. ↑ "Cubs-Dodgers NLCS: Cubs end 21-inning scoring drought in a big way in Game 4". CBSSports.com. Retrieved 2016-10-20. ↑ "Cubs vs. Dodgers | 10/19/16". Major League Baseball. Retrieved 2016-10-20. ↑ Tribune, Chicago. "Cubs beat Dodgers 8-4 in Game 5; take 3-2 lead in NLCS". chicagotribune.com. Retrieved 2016-10-21. ↑ "Cubs-Dodgers NLCS Game 5: Final score, things to know as Cubs near World Series". CBSSports.com. Retrieved 2016-10-21. ↑ "Cubs beat Dodgers 5-0 to reach 1st World Series since 1945". ESPN.com. Retrieved 2016-10-24. ↑ Johnson, Raphielle (2016-10-23). "Kyle Hendricks Pitching Line: Game 6 Stats in NLCS Masterpiece". Heavy.com. Retrieved 2016-10-24. ↑ "Baez, Lester share NLCS MVP award". WGN-TV. 2016-10-23. Retrieved 2016-10-24. ↑ "Cubs blank Dodgers to advance to first World Series in 71 years". Guardian. 23 October 2016. Retrieved 25 October 2016. ↑ Levine, Bruce. "Levine: Kyle Schwarber Lone Bright Spot For Cubs In Game 1 Loss". Retrieved 2016-10-26. ↑ Wagner, James (2016-10-26). "Wait Over, Indians Strike Quickly in Opener Against Cubs". The New York Times. ISSN 0362-4331. Retrieved 2016-10-26. ↑ Tribune, Chicago. "Corey Kluber a strikeout machine vs. Cubs, sets World Series record". chicagotribune.com. Retrieved 2016-10-26. ↑ "Magic formula: Corey Kluber, Andrew Miller dominant in Game 1 World Series win over Cubs". USA TODAY. Retrieved 2016-10-26. ↑ "Cubs-Indians World Series Game 2: Final score, things to know as Cubs even series". CBSSports.com. Retrieved 2016-10-27. ↑ "Next stop: Chicago! Cubs trounce Tribe, even World Series". ESPN.com. Retrieved 2016-10-27. ↑ CNBC (2016-10-27). "Rizzo, Zobrist lead Cubs' offensive outburst in Game 2 of World Series". CNBC. Retrieved 2016-10-27. ↑ "Kyle Schwarber defying odds, leads Cubs offense in Game 2 of World Series". USA TODAY. Retrieved 2016-10-27. ↑ Wagner, James (2016-10-27). "Cubs Pull Even in World Series as Indians' Play Proves Sloppier Than the Weather". The New York Times. ISSN 0362-4331. Retrieved 2016-10-27. 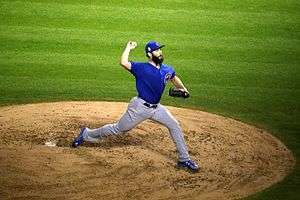 ↑ "World Series Game 2: Cubs' Arrieta finds greatness when his team needs it most". CBSSports.com. Retrieved 2016-10-27. ↑ CNN, Jill Martin. "Cubs level World Series, first Fall Classic win since 1945". CNN. Retrieved 2016-10-27. ↑ Mather, Victor; Waldstein, David (2016-10-28). "World Series: Here's What Happened in Game 3". The New York Times. ISSN 0362-4331. Retrieved 2016-10-31. ↑ "Live from Wrigley: Bill Murray delivers, Cubs not so much". ESPN.com. Retrieved 2016-10-31. ↑ "A tense and taut World Series Game 3 goes to Indians, 1-0". Washington Post. Retrieved 2016-10-31. ↑ Staff, AOL. "Indians edge Cubs at Wrigley Field in Game 3, forge 2-1 lead in World Series". AOL.com. Retrieved 2016-10-31. ↑ "Indians-Cubs World Series Game 4: Final score, things to know as Indians go up 3-1". CBSSports.com. Retrieved 2016-10-31. ↑ Tribune, Chicago. "Cubs fall to Indians 7-2 in Game 4; trail World Series 3-1". chicagotribune.com. Retrieved 2016-10-31. ↑ "Corey Kluber lifts Indians in Game 4 of World Series, moves Cleveland near title". Washington Post. Retrieved 2016-10-31. ↑ "Indians-Cubs World Series Game 5: Final score, things to know as Cubs force Game 6". CBSSports.com. Retrieved 2016-10-31. ↑ Witz, Billy (2016-10-30). "Cubs Aren't History as Chicago Denies Indians a Title in Game 5". The New York Times. ISSN 0362-4331. Retrieved 2016-10-31. ↑ "Cubs' Joe Maddon goes all in, deploys Aroldis Chapman for eight-out World Series save". USA TODAY. Retrieved 2016-10-31. ↑ Kepner, Tyler (2016-11-02). "37th World Series Game 7 Represents Rare Opportunity for Cubs or Indians". The New York Times. ISSN 0362-4331. Retrieved 2016-11-02. ↑ "Cubs-Indians World Series Game 6: Final score, things to know as Cubs force Game 7". CBSSports.com. Retrieved 2016-11-02. ↑ Hoffman, Benjamin; Waldstein, David (2016-11-01). "World Series: Here's How the Chicago Cubs Won Game 6". The New York Times. ISSN 0362-4331. Retrieved 2016-11-02. ↑ Brisbee, Grant. "The Cubs finally won the World Series, in one of the best baseball games ever". SBNation.com. Retrieved 2016-11-03. ↑ "Cubs win World Series after 108 years waiting". Major League Baseball. Retrieved 2016-11-03. 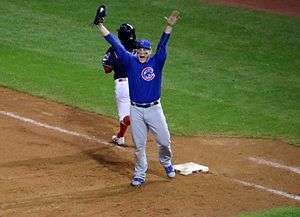 ↑ "Cubs win World Series 2016". ABC7 Chicago. 2016-11-02. Retrieved 2016-11-03. ↑ CNN, Jill Martin. "Believe it! Chicago Cubs end the curse, win 2016 World Series". CNN. Retrieved 2016-11-03. ↑ "At Last: Cubs win first World Series since 1908 with 10-inning, Game 7 victory". Fox News. 2016-11-03. Retrieved 2016-11-03. ↑ "Cubs win! Cubs win! Cubs win!". Chicago Tribune. 3 November 2016. Retrieved 3 November 2016. ↑ "Cubs End 108-Year Wait for World Series Title, After a Little More Torment". New York Times. 3 November 2016. Retrieved 3 November 2016. ↑ Stark, Jayson. "How did the Cubs' curse end? With the greatest game ever". abcnews.go.com. ABC News. Retrieved 4 November 2016. ↑ Padilla, Doug (October 16, 2016). "Dodgers add Alex Wood, Enrique Hernandez to NLCS roster; Cubs add rookie lefty". ESPN. Retrieved November 8, 2016. ↑ Rogers, Jesse (October 25, 2016). "Cubs place Kyle Schwarber on World Series roster". ESPN. Retrieved November 8, 2016. ↑ Glaser, Kyle (November 28, 2016). "2016 Organization of the Year: Cubs Build From Ground Up To Title". Baseball America. Retrieved 2016-12-03. ↑ Tribune, Chicago. "Cubs' Theo Epstein named Sporting News Executive of the Year". chicagotribune.com. Retrieved 2016-11-10. ↑ Muskat, Carrie (17 November 2016). "Bryant wins NL MVP year after winning ROY". MLB.com. MLB Advanced Media. Retrieved 20 November 2016. ↑ Tribune, Chicago. "Cubs' Anthony Rizzo and Jason Heyward win gold gloves". chicagotribune.com. Retrieved 2016-11-10. ↑ "Two Cubs, three Red Sox players headline 2016 Silver Slugger winners". CBSSports.com. Retrieved 2016-11-11.